Frankenstein's Monster, often simply referred to as the monster and affectionately called Frank by its creator in the episode, is a horrible undead being created by Dr. Frankenstein. It also, apparently, lives in Mario Brothers Plumbing with its creator. In The Super Mario Bros. Super Show! 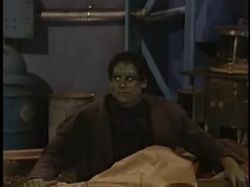 live-action segment "The Mario Monster Mash", the monster is moved from Transylvania to Brooklyn, New York in a crate when Dr. Frankenstein moves there. It is only after being called big, ugly, and scary by Mario, does the monster emerge from the crate, angered about this insult to its appearance. After making its dramatic entrance, the monster is later tied to an operating table near a machine by Mario and Luigi while Dr. Frankenstein explains that he had promised the monster a new brain. The monster is eventually left in Mario Brothers Plumbing with Mario, Dr. Frankenstein having left the apartment with Luigi to search for a brain, after failing to persuade Mario into giving the monster his. Eventually, Mario, becoming sleepy, decides to lie-down on an operating table near the monster. As Mario falls asleep, the monster, managing to get its arm free from the bonds that hold it, manages to pull a switch on a machine, this causes itself and Mario to be shocked with electricity. It is only when Luigi and Dr. Frankenstein return to the apartment that it is revealed that the switch the monster pulled activated a machine that switched Mario and the monster's brains. Dr. Frankenstein, seeing his brain-switching machine is low on power, decides to put Mario and the monster's brains back to their regular bodies in a different manner; using a frying pan, Dr. Frankenstein bashes both the monster and Mario on their heads, somehow returning them to normal. Frankenstein's Monster was last seen leaving Mario Brothers Plumbing while being comforted by its creator, who says he's sorry that he allowed the monster to have its brain switched with such a horrible one.